Tracks in 3 inches of otherwise unmarked snow told the story as plain as the writing on this page. A vehicle had pulled to the side of the road earlier that morning, and a passenger had gotten out and fired repeatedly into the adjacent soil bank field. The snow was pockmarked with ejected cases, and I figured the shooter was likely one of the local farmers, a man I’d hunted with on numerous occasions. His favorite rifle for jumping fox was an army surplus semiauto .30 carbine. I knew the chances of a fox still being in the field after that bombardment were nil, but I also knew a connected finger of weed-choked soil bank extended to within 50 yards of the farmstead on the far side of the section. I figured there was a chance any jumped fox had simply moved to the upper end of this cover. My partner and I drove to the farmhouse, where we caught the family at home but getting ready to leave for church. The farmer was a pheasant hunter, and when I explained why I thought a fox or two might be hiding in the weeds near his home, he told me to shoot as many of the pheasant-eating varmints as I could, as long as I shot away from the house. The slight breeze was perfect for that approach, and my hunting partner and I sneaked silently to the lower end of a wooded grove, some 300 yards behind the house and 100 yards from the edge of the weeds. My cohort was toting a 12 gauge and I had brought a then-new .222 Remington 722. We situated ourselves at the base of a clump of maples where our white army surplus camo helped us blend in with the snowy brush. I started squalling on a cottontail distress call, and within a matter of minutes, a pair of cherry red fox came bolting out of the weeds headed our way. The earlier shooting must not have spooked them, at least not enough to dampen their winter-whetted appetites. We agreed before going in that if more than one fox responded, we would let them get within shotgun range and then I would take the farthest fox with the rifle. That would be my partner’s cue to shotgun the closer fox. Worked like a charm, and when my partner jumped up to retrieve our fox, I caught a blur of red at the far side of the weedy cover as a third red fox beat a hasty retreat. Over the ensuing years, I called up a dozen or more red fox from that little weed patch, and it didn’t make any difference how hard the road hunters worked the lower end of the field, there always was a fox or two in the honey hole behind the farmer’s house. Fox are smart critters, and you can bet they had the local road hunters patterned. Back in my younger days, I collected a lot of prime pelts simply because I was willing to work a little harder to get them. Even today, with predator hunting experiencing unprecedented popularity all across the country, I still find honey holes that go virtually unhunted because the location is off the beaten path or maybe just not where most predator callers would think to take a stand. One cold winter morn, back at the peak of the fur boom era, I spotted an elk carcass a couple hundred yards off the highway, probably a road kill that had managed to make it that far before laying down to die. I figured the local coyotes had already found it; their feathered escorts, the ravens and magpies, were feeding heavily. Tracks in the snow showed where another hunter had reached the same conclusion, parked and then walked in toward the carcass. With the aid of binoculars and then a spotting scope, I visually followed the tracks a half-mile into a patch of willows, where I assumed the fellow had set up to call. The tracks followed a slightly different path back to the road. Another 1/2-mile on the other side of the elk carcass, a ridge with a wide brushy slope provided countless places where a coyote could lay up and observe every bit of activity between the highway and the carcass. I doubted the earlier hunter had been successful. I knew where a county road ran along the backside of the ridge, so I drove over and followed it well past where the elk carcass lay. Then I pulled the truck over, parked, and donned a pair of Sherpa snowshoes. I trudged a half-mile back toward the carcass, all the while staying in the brush and aspen on the backside of the ridge. An hour later, I eased cautiously to the top of the ridge and then literally crawled (as much from exhaustion as caution) into position under a low cedar where I had a clear view all the way down the slope, across the bottom brush to the highway. There was plenty of cover, and I figured any coyote feeding on the carcass was likely laid up somewhere within earshot. Once my heartbeat and breathing got back to normal, I cut loose with some serious jackrabbit distress sounds. The Burnham Black Magic call was still in my mouth when the first coyote came wending its way through the oakbrush. Then, about the time I was lining up the shot, two more appeared about 100 yards behind it. I centered the crosshairs on the farthest coyote, which also appeared to be the largest and to have the palest pelt. When the big dog bounced to a stop, I applied the final pressure on the trigger of the .220 Swift, and the coyote piled up in the snow. I located the second coyote headed back the way it had come and immediately started in with some strident coyote distress yelps. That brought the pell-melling coyote to a bouncing broadside halt at 300 yards—point blank for the Swift. With the second coyote down in the snow, I started looking for the third, the one that had first responded to my calls. By then, that one, too, was some 300 yards out, weaving swiftly through the oak clumps. A tough shot, but I followed with the crosshairs and kept yelping. Finally, the coyote couldn’t stand it any more and stopped in typical coyote fashion, turning broadside to look back and locate the source of the sound. Bad mistake. The 52-grain Hornady A-Max boattail knocked that coyote clean off its feet. Took me another hour to skin the coyotes and roll the prime pelts onto a rope around my waist. Then I strapped the snowshoes back on and started trudging to the truck. Hunting smart, and putting in the extra effort, had paid off big time once again. Predator callers, myself included, tend to call the same places with the same sounds, as long as we are still getting some shots. This may seem to be working, but rest assured there are critters that we never see, call-shy predators that pattern us through sight, scent or sound. To test this theory, a calling buddy and I spent an entire January day hunting locations where I’d previously enjoyed some success. At two setups, we called in the vicinity of carcasses that I had put out specifically to draw coyotes into areas where I knew I could sneak in, call and maybe get a shot. By the end of the day, we had managed to shoot one coyote near a carcass and see two others that wouldn’t come out of the timber and into shooting range. The following day we hunted the same areas, but this time we busted our butts and snowshoed into the backside of each location and then set up to call. Yes, these were new stands, but all within a mile of where we’d called the day before. Because of the effort it took to get into these stands, often an hour or more of snowshoeing, we managed three fewer setups before darkness shut us down. Of course, we also had five prime coyote pelts in the truck, and should have had two more. One of my most memorable days calling fox occurred years ago, near my home town in southwestern Minnesota where an ornery old bachelor farmer wouldn’t allow any hunting on his weed-choked farm. This prime piece of predator habitat extended to within 100 yards of the tree-lined Rock River, and the adjacent farm, where the river flowed, was almost entirely tilled cropland and pasture that offered little in the way of cover, other than the trees along the river. But I was able to gain permission to hunt there, and I hatched a plan to maybe call a fox or two over off of the irascible neighbor’s land. The first time I tried it, a buddy dropped me off on the closest road, and I hiked in a couple of miles along the river. I took a half-dozen impromptu stands, and since the treeline was only 100 yards or so from the inside edge of the heavy cover on the neighbor’s land, I kept the dying rabbit serenade on low volume. The strategy produced two red fox and an unexpected gray that appeared on the sloping limb of a tree, maybe 30 yards out in front of me. 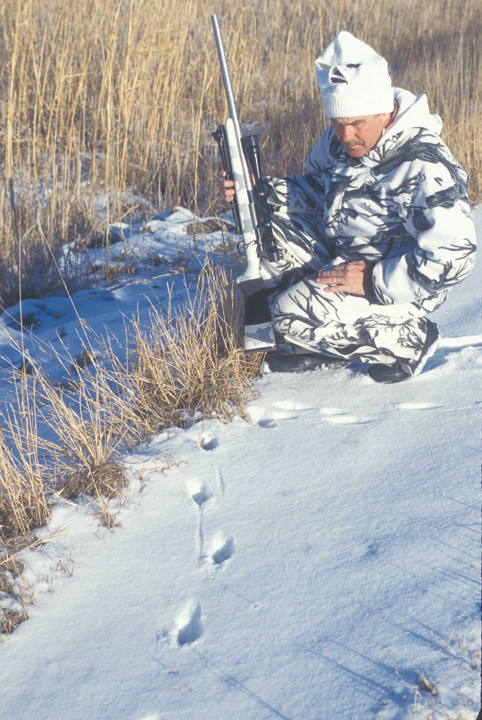 Playing the run-and-gun numbers game can pay, too, especially in areas where predators are plentiful and maybe haven’t yet heard the calls. But when I start to feel like I am chasing my own tail, I figure it’s time to sit back and reevaluate. When I catch myself hustling to get in as many calling setups as possible, I remind myself of the many times it has paid to take a different, more thoughtful tack. Yes, I’ve slowed down a bit and may not hunt as hard as I once did, but I still hunt just as smart.